At his inauguration, President Donald Trump painted a bleak picture of America, blaming “gangs and drugs” for causing “American carnage.”1 As explained in a recent Center for American Progress column, since entering politics, Trump has exaggerated the threat of violent crime and street gangs such as MS-13 in order to gain support for his policies.2 While politicians have long used racialized fear tactics to sell tough-on-crime policies, Trump’s use of them stand out as particularly explicit and detached from facts. The president’s specious claims have come at too great a cost for black and Latino communities, both of which are often on the receiving end of punishing criminal justice and immigration enforcement systems in the United States. Public safety approaches must be based in evidence rather than fear. Without doubt, gang violence—like any violence—is devastating and should be treated as a serious priority for law enforcement. But this administration is conflating gang crime with illegal immigration, and painting communities of color as bastions of lawlessness, in a cynical effort to capitalize on fear and sell draconian tough-on-crime policies. Against this backdrop of an exploitive administration that is hostile to the rights of people of color,13 a justice system plagued with racial inequalities,14 and the reality that violent crime is on the decline, it is critical that law enforcement and lawmakers consider the ramifications of labeling someone a gang member. There is no fixed legal definition of “gang” or “gang membership.” Since gangs and gang affiliation are so loosely defined both across the country and across law enforcement agencies, the burden of proof to be considered a gang member is often low. This is problematic because a gang label can come with crippling consequences for individuals who find themselves in the criminal justice or immigration system. 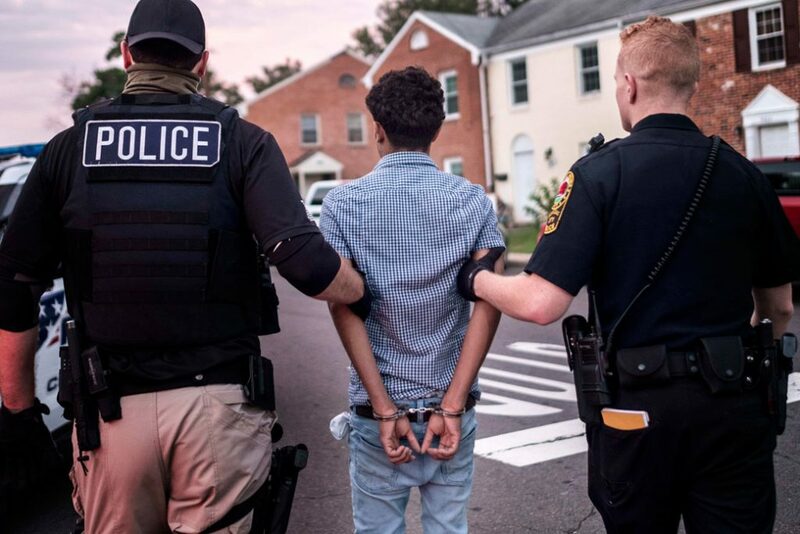 Accusations of gang membership in the criminal justice context can be used to impose immigration consequences on noncitizens, including individuals who lack criminal records. Gang membership in and of itself is not grounds for removal under the Immigration and Naturalization Act (INA)—the body of law that governs U.S. immigration proceedings. The INA neither defines gang membership, nor does it outline specific immigration consequences for gang membership.35 In other words, gang membership alone is insufficient to make an individual deportable.36 Still, alleged gang affiliation can carry significant consequences for noncitizens, up to and including detention and deportation. This is because gang affiliation makes an individual an enforcement priority for the DHS, even in instances where that individual lacks a criminal record. Allegations of gang membership are used in a variety of immigration-related contexts, including when individuals are applying for immigration benefits.37 Claims of gang affiliation may arise as disclosures during custodial or noncustodial interviews with DHS or as evidence presented during bond and individual hearings in immigration courts.38 Some other common consequences of gang membership allegations include being ineligible to obtain immigration relief, such as asylum, a green card for permanent residency, temporary relief from deportation under the Deferred Action for Childhood Arrivals (DACA) program, or other immigration benefits. Unlike defendants in criminal court, respondents in immigration court do not have the right to a court-appointed attorney. Nor are there rules of evidence in immigration proceedings, making it more difficult for respondents to dispute accusations of gang affiliation.39 Furthermore, in immigration court, judges have wide discretion to decide case outcomes. Depending on the specific laws of a jurisdiction, the collateral consequences that stem from being placed on a gang database vary. Common consequences include racial profiling, increased police surveillance, longer sentences, and due process violations. In some jurisdictions, individuals may be subjected to gang enhancements or injunctions. For noncitizens, immigration benefits may be denied. Without doubt, gang crime—like all crime—is serious and merits law enforcement attention. Nonetheless, the methods of gang enforcement discussed in this brief do not meaningfully improve public safety and come at too great a cost for young black and Latino individuals who must live with the severe consequences that stem from gang identification. Violent crime in the United States is trending at a historic low—even among youth.64 In order to continue this trend, it is imperative that jurisdictions rethink their approach to tackling crime from a smart criminal justice perspective. Maritza Perez is the senior policy analyst for Criminal Justice Reform at the Center for American Progress.